Hey guys. I'm still around, I promise. Work has been super busy, and so have I. So busy in fact, that I've opened an Online Store!! At the moment, there's bookmarks, buttons, charms, jewelry - and more to come soon! AND, if you Like the Shop's Facebook Fan Page, you'll get informed of contests/giveaways, special promotional items, and news about all the newest products. For the Grand Opening, once the Facebook page gets to 15 fans, I'll be posting a special promotional code to receive 35% off of your first purchase! DeviantArtist QuestionnaireHow long have you been on DeviantArt? I joined DA on April 22, 2003 - 12 years!! What does your username mean? I just recently updated the username to match my online shop that I run. What was your first deviation? Oh gosh, no idea. My gallery has gone through a couple of destashings. If you could instantly master a different art style, what would it be? More realistic shading! I'm back from the depths...Hey all! It's been far too long since I've been on dA and I think it's time that I come back. Over the next few weeks, I'll be uploading some artwork that I've been working on - as well as become more active in the community again. In the meantime, be sure to check out my online shop, Byte Size Treasure! But it's that time of the year again - time for me to move. Which also means, I'm in desperate need of a bit of extra cash. I'm opening commissions for mermaids. 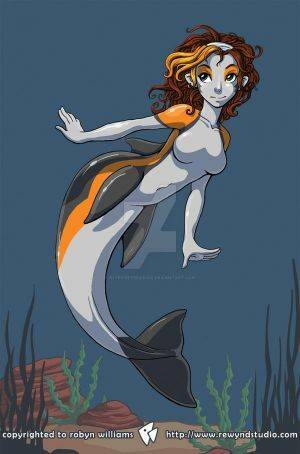 You can chose to have me finish one of the MLP Mermaids, draw your character as a mermaid, or a famous character that you like as a mermaid. 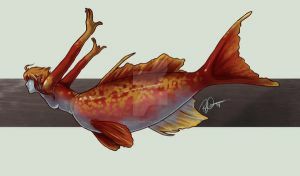 You can chose the character, as well as the type of aquatic life that I morph them with - or you can leave it to me. All Moved in and tumblrWe're all moved in! I also don't have a desk at which to work at - except for my tiny little drafting table, which is not enough room for my monitors, cpu, AND tablet. Due to box size (not fitting in our car) I was unable to get my desk from IKEA this weekend - but we're getting it next weekend. YAY!! I'm going to be posting before and after shots (as well as in progress shots) of my office on my tumblr. My dA subscription is up in 5 days. I don't know if I'll be able to get a new one. We'll see. I will try my best to keep this up to date with commisison information/prices. If you have any more questions, feel free to check my FAQ (or note me). Background Prices are negotiable - based on complexity. No matter what you order, you get a digital (flattened) file at 300 dpi. Word Feature : 'Mystery'Welcome to my 1st official "feature." I'll try to update and do new features every few weeks or so - and for the New Year (2009), I'll do 9 pieces for each feature. For the first feature, I did a search through various sections of Deviantart using only the word "mystery." Below are the pieces I found most interesting based on this word. Online Shop Open NOW!Hey guys. I'm still around, I promise. Work has been super busy, and so have I.